Do you ever open your kitchen cabinet only to fumble around for a few extra minutes trying to find what you need. This has been my battle ever since we added the additional cabinet space. As my belly grew it became more and more difficult to get to anything that wasn’t in arms reach. 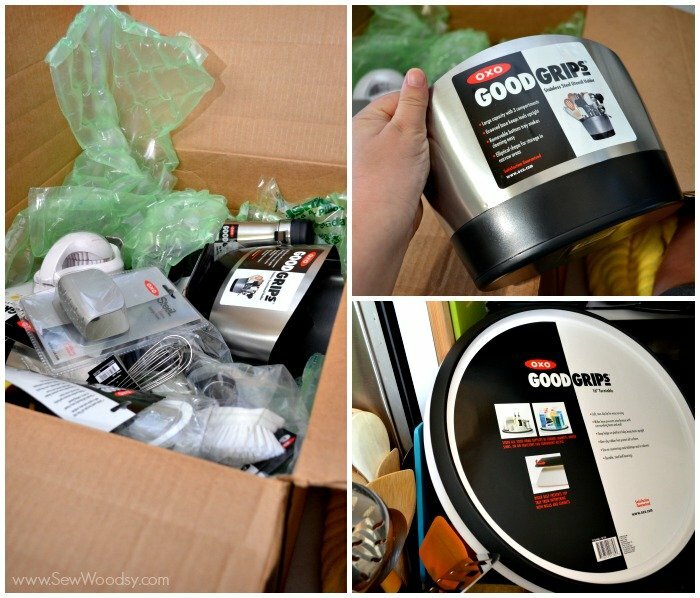 My friends at OXO sent me a box of kitchen organization goodies to get my kitchen cabinets and countertops in check! 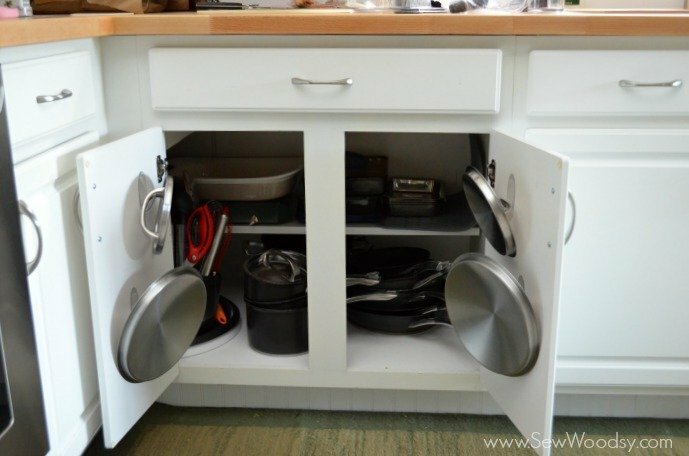 Today, I’m here to share 5 Effective Tips for Organizing the Kitchen. Here is the before of the corner kitchen cabinet. I was most excited to get not one but two utensil holders and a 16″ turntable. I felt that this was really going to make a big impact on cleaning up my corner cabinet. 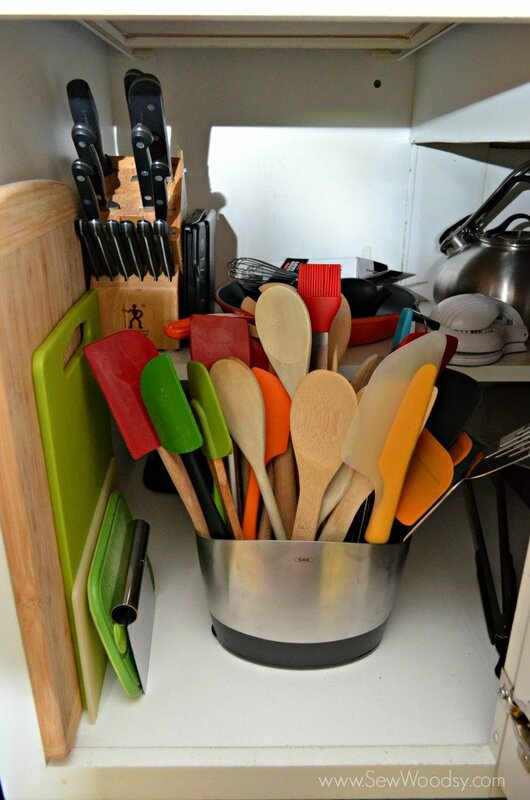 Tip 1: Find a holder for all the utensils. 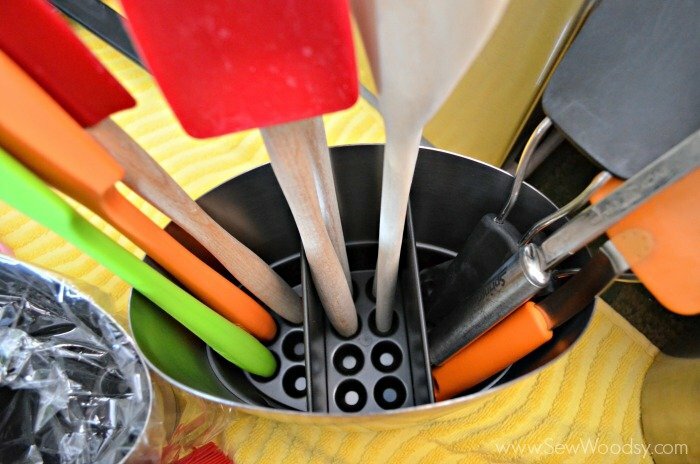 I have a lot of kitchen utensils so finding the utensil holder that worked for me was key. I like this one because it has indentions at the bottom so that all of your utensils stand up straight. I also like how wide it is. The round ones haven’t seemed to work for me in the past. I think this is so important when you’re trying to utilize all your space! Because of the top shelving my turntable can only move halfway, but it works out perfect because I’m able to get exactly what I need. I also placed our pizza pan on the top of the turntable to utilize even more space! 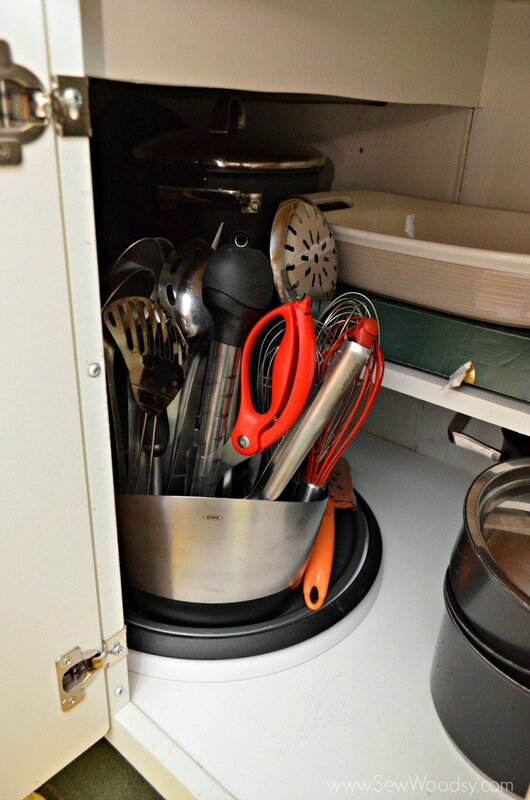 Tip 3: Hang the pot lids on the cabinet doors. While visiting NYC over the holidays, we met with the PR rep from 3m, Kim. 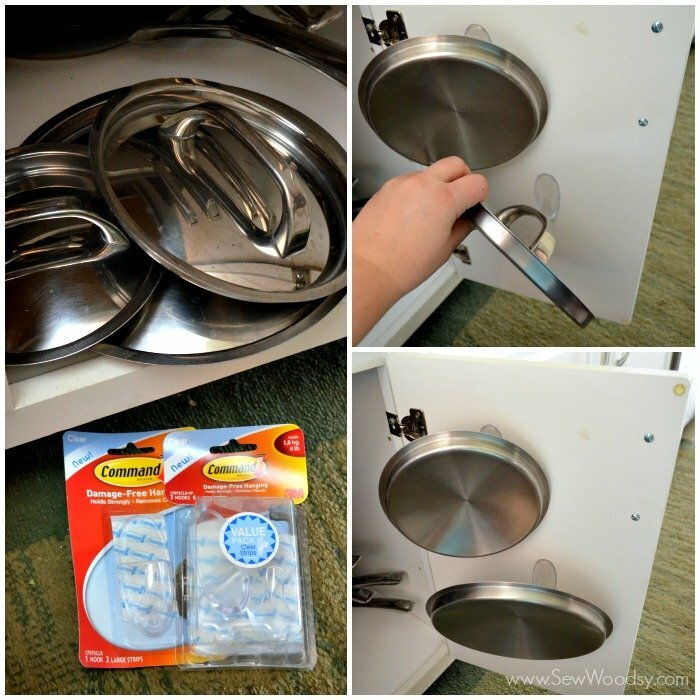 She told us about this genius idea on hanging pot lids using Command Hooks. We put her idea to work and voila! 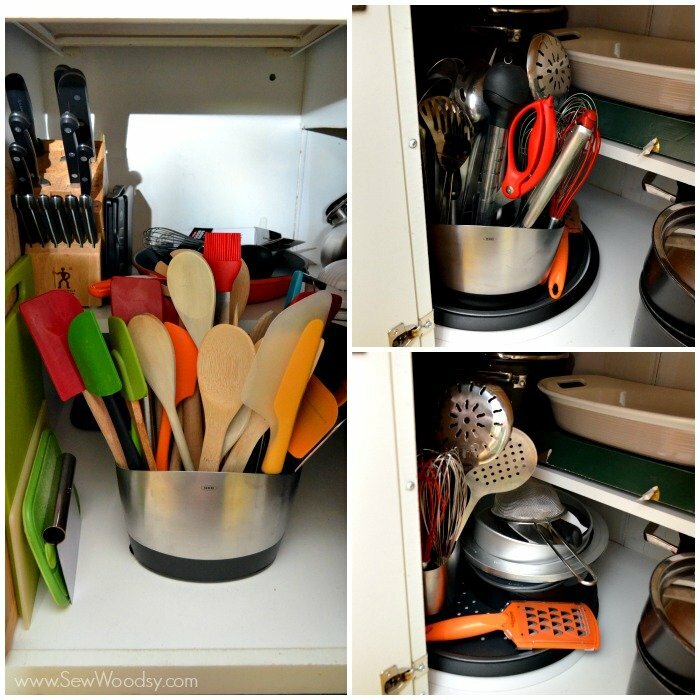 It worked and now I have increased additional space in my cabinets! 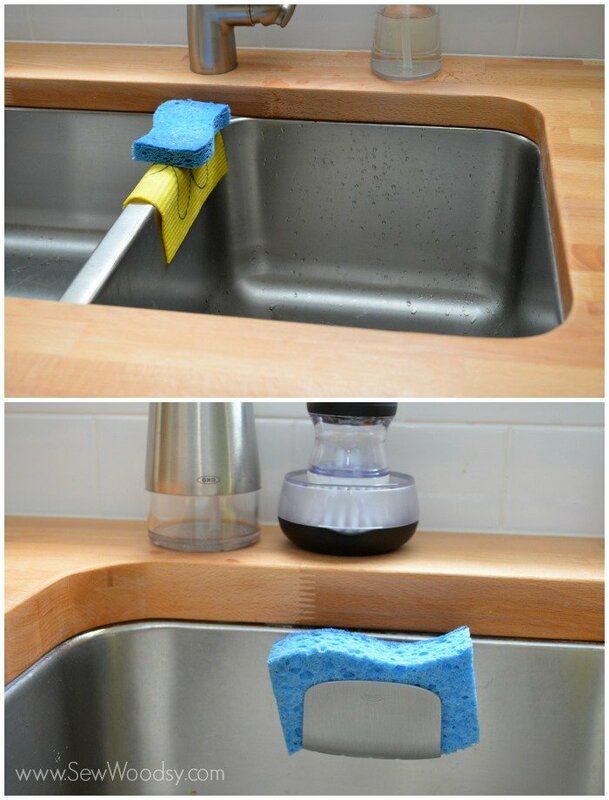 Tip 4: Use a sponge holder in the sink. 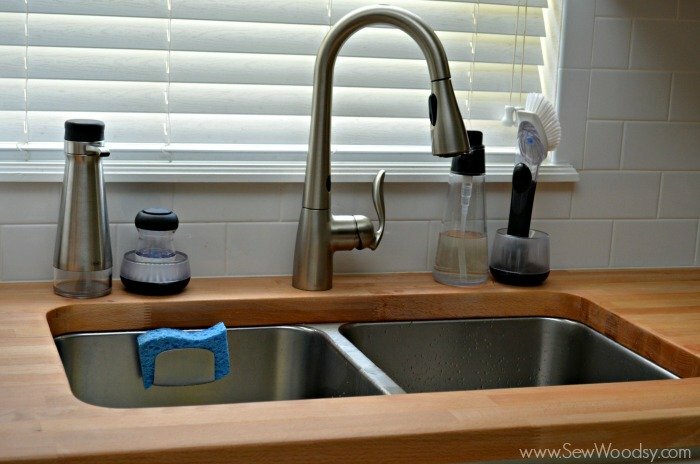 When it comes to the sink… having a sponge holder is ideal. 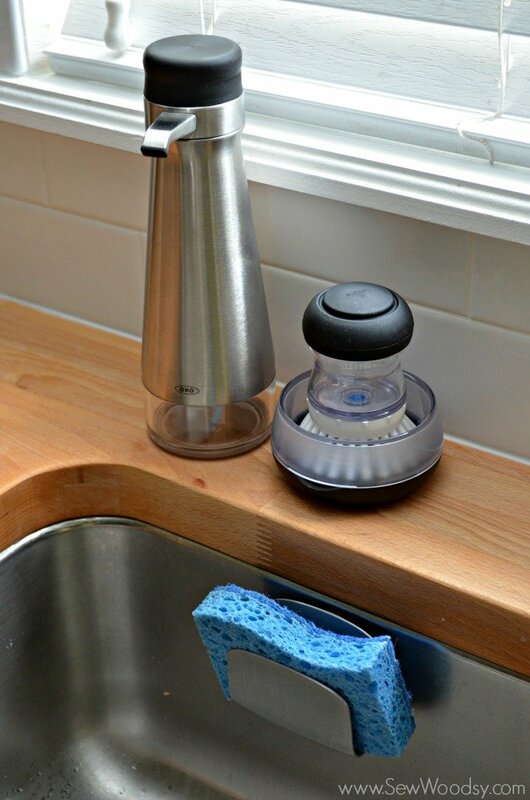 It might seem like a frivolous thing but when your sink is piled with dishes and that said sponge is buried at the bottom you’ll be happy you have a sponge holder to keep it in place! Plus it looks much nicer than just balancing it in the middle of your sink! Tip 5: Keep the brushes and soaps in an easy to access area. 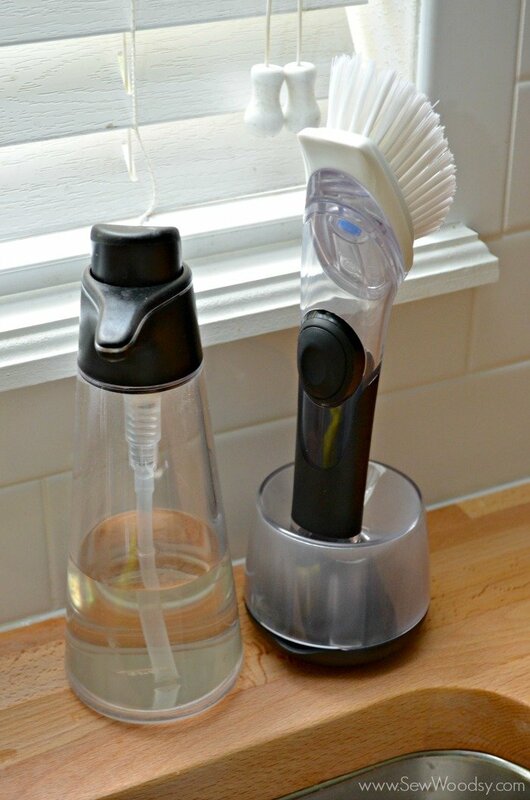 I love using the OXO soap dispensers to store dish soap and hand soap. We buy the soap in bulk at Costco and don’t want to have a massive soap container on top of the counter. Refilling soap containers is much more economical and eco-friendly! We also like to use the scrub brushes that have soap built into them! 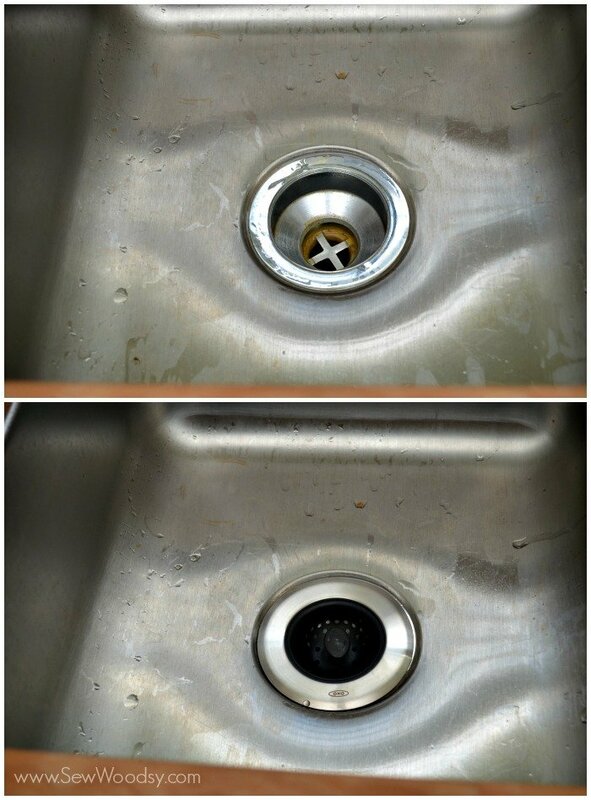 I love how neat the sink area looks. We also got a new silicone sink strainer & stopper. The new one that I bought when we got our sink has already broke so it was nice to get this one. When it gets dirty you just run it through the dishwasher on the top wrack! Easy as that. 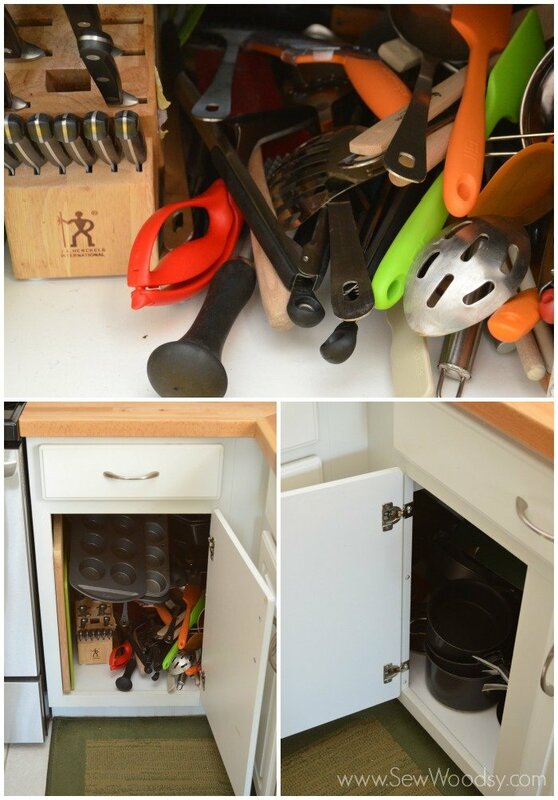 Here is how clean and organized the cabinets look! The before and after is amazing. I love how organized and easy-to-find everything is now! 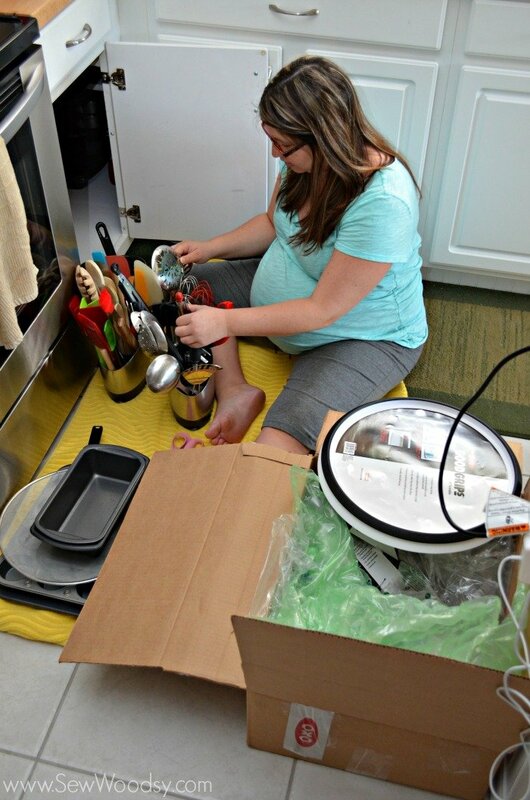 And for good measure, here I am 9 months pregnant organizing the kitchen cabinets. One would call this nesting–I just call this doing a little spring cleaning/organizing! 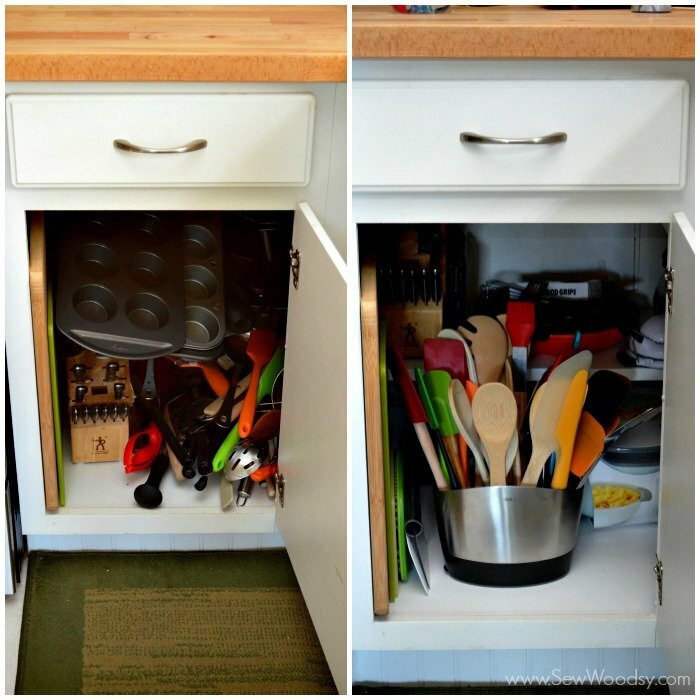 I would love to hear some of your effective tips for organizing the kitchen! Disclaimer: We received organization and cleaning products from OXO. We love OXO and love working with them. We also have a giant box of Command Hooks that we received at Haven last year, so yeah, they were free, but we love using them regardless if we pay for them or not! All opinions are our own. I need that utensil holder NOW! Love it! I like the scrub brush and cozy for it. I need to replace my brush desperately! It’s amazing that we forget to replace things like scrub brushes… highly recommend this one! I need that utensil holder. Being Italian, I like to cook and have tons of gadgets. Great organizing! Thanks Barbara–our kitchen was in need of some organization!!! Where, oh where did you find the little round dish to hold your short round scrub brush? I have a little brush like that (by Oxo) but it did not come with the small dish. I want one! I would imagine you could find it at Bed, Bath, and Beyond? It was sent to us directly from OXO so I’m not sure–sorry! I love OXO products. I need to get one of those sink strainers! Us too! I’m in love with that little sink strainer! Look at your cute self nesting and organizing! What a neat product! 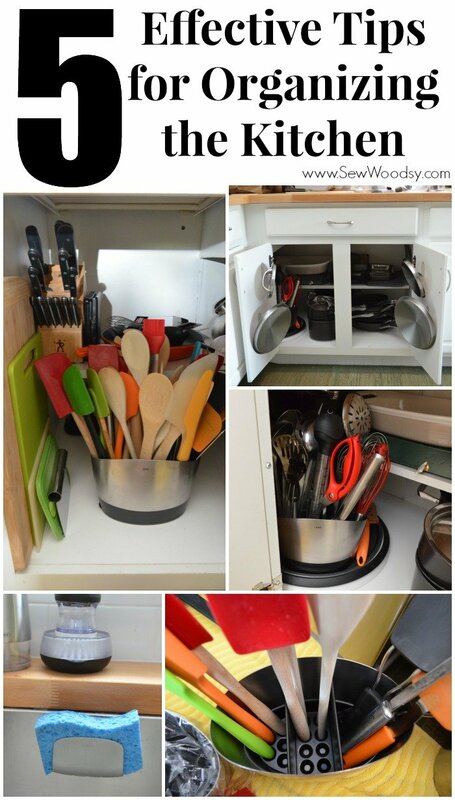 I really like how you showed the way you used all of these products to organize your kitchen. I think I need to do some shopping! I love the utensil holder! I need one of those now! LOVE your ideas! And that utensil holder with the indentions is brilliant! Thanks Keri–I know the people at OXO think of everything!!! Your cabinets are so organized now! I’m sure that cooking is a lot easier now that you don’t have to dig to find what you need. The last time I reached into the utensil drawer I cut myself, so yes, I definitely need this! Amy, that is always my fear. One more reason why I wanted to clean up my cabinets. I think it’s time for a little kitchen spring cleaning/organizing. I so need all of these things, definitely checking out the OXO line now!